I don't remember exactly what brought this issue to my attention-- it may have been this blog post I read, which prompted me to do some additional research. But I'm pretty irritated. And frustrated. 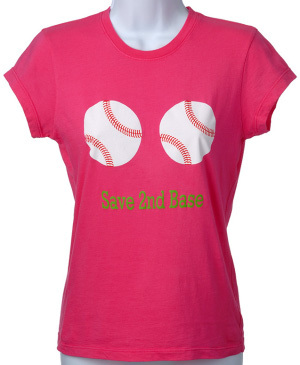 It's the Breast Cancer awareness campaigns and anti-breast cancer t-shirts that are being manufactured, bought and worn. Disclaimer: I am 100% in favor of fund-raising, awareness, education, what have you, about breast cancer. * That's not what this is about. However, the way advocacy is framed is just as important as the advocacy, for the "way you say it" speaks just as much as "what you say." So to recap, not only are saving the breast not the woman, the focus of the campaigns, but the reason for doing to isn't even about preserving the sexual pleasure that the woman's breasts give her, but is instead about their benefit to others, predominately to men--not only your (presumed male) partner, but to the community of men at large. "We men" love 'boobies' so we'll work real hard so you don't have to have them surgically removed. And we women should be "responsible" and look after them because the dudez love 'em. And we all know women should do things about their body because it's what men love. Not because, well, women might die! Of course, the end message "look after your body" is correct but the reason to do so is 100% absolutely wrong. It is an unfortunately and troubling result of how women's bodies are seen: as first and foremost for someone else's pleasure, as something to be looked at and not something that works, that does things, that has a functional purpose, and that gives the woman herself pleasure. Rethink's "Booby Wall" starts off saying about it's call to upload images of your breasts: "this isn't Maxim...this is beautiful" only to be followed by "this is worth living for." Excuse me? Um, no, my breasts are not worth living for, my life is worth living for! Yeah, let's display all sort of breasts as examples of the beauty in the variety of breasts to prove that your breasts are important, valuable and worth living for. Gee, that sure sounds like an awesome initiative! And no, this is not a case of Aw, just lighten up!-Whatever will get people to fight breast cancer-What's the Big Deal? No, sorry. This is the message women get ev-ry-where. And now when the issue is supposed to be about women's lives, we're appealing to save women's bodies?! Women's bodies are valuable regardless of what they mean to men and the male gaze, and women's lives are important regardless of their bodies. End of story. Reasons why we fight breast cancer? Because it takes a chunk of your life away. Because a woman losing her breasts can make her lose out on sexual pleasure. The "because a woman's partner may lose our on sexual pleasure" is at the bottom of the list. That "men like looking at as many breasts as possible and anything that makes them go away should be fought against" is not on the list. The campaigns rely on a sexist framework regarding the female body and what/who it is for, and they perpetuate such sexism in the design of their campaigns. *Even though the way breast cancer has been produced in medicalization has a very gendered element to it, in the way that the comparative silence around prostate cancer and prevention is also quite gendered. I'll write on this in the future. But for now, ponder on why it might be that we encourage women to do self-breast examinations monthly--and this is a common-knowledge thing--and we don't advocate men doing self-testicle exams. Even though considering the various tissue obstructions in the breast, it would be much easier to discover lumps in the testicles than in the breast.